Probably one of my biggest challenges when it comes to living a low waste, practically plastic free family life is finding plastic free fruit and veg that is also organic. It really ain’t easy, especially in the supermarkets which is let’s face it, where most of us do our food shopping. 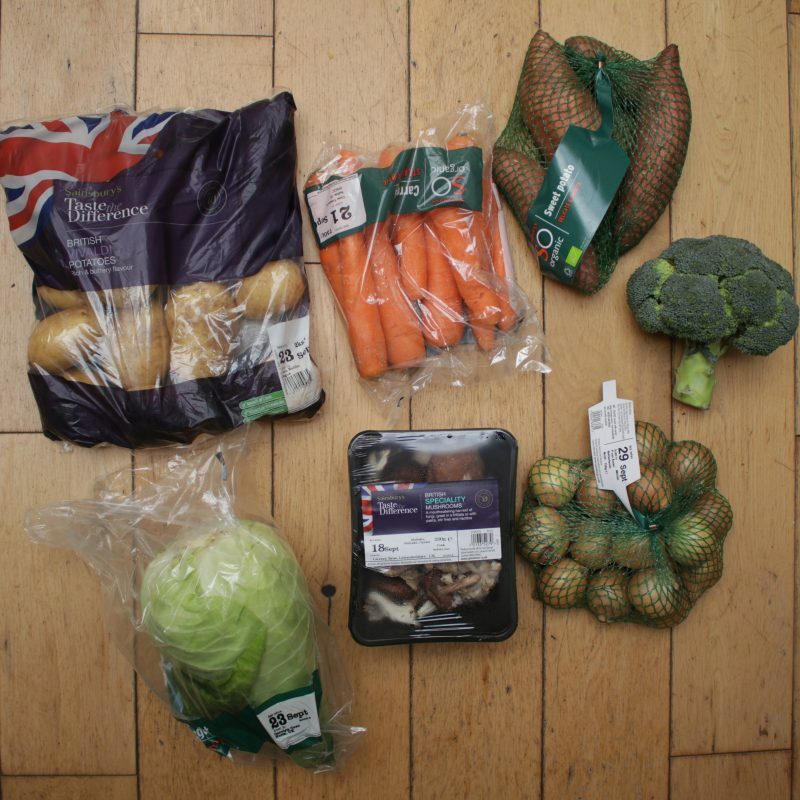 In today’s post I go on a little mission to compare as much as possible, like for like, the organic vegetables in a Riverford Veg box with the veg in my local Sainsburys. What I find is a little ridiculous…. In short, when shopping for organic vegetables in a supermarket, I was faced with a total sea of plastic – rows and rows of plastic wrapped fruit and veg, to be precise. Whether it’s because organic food tends to be less robust than non organic food (it is bred to make it taste great and to resist pests rather than hardiness and durability to suit the supply chain and transportation) or because wrapped goods offer up a sense of luxury which some people might seek if buying organic, there’s no escaping the colossal amounts of plastic packaging used for organic produce in the supermarket. Which is why I’m increasingly becoming interested in seeking alternative ways to source organic fruit and veg – veg box delivery schemes being one of them. And when I read that last year Riverford removed 180km of plastic nets in favour of compostable beech nets, unwrapped several popular veg, and overall saved 1.5 tonnes of plastic per year, my interest was sparked. In addition, Riverford have recently committed to use only home compostable materials by 2020. They clearly take plastic seriously, and sustainability is at the heart of their ethos. “Our customers just hate plastic with a passion”, says Guy Singh-Watson, farmer and founder of Riverford. 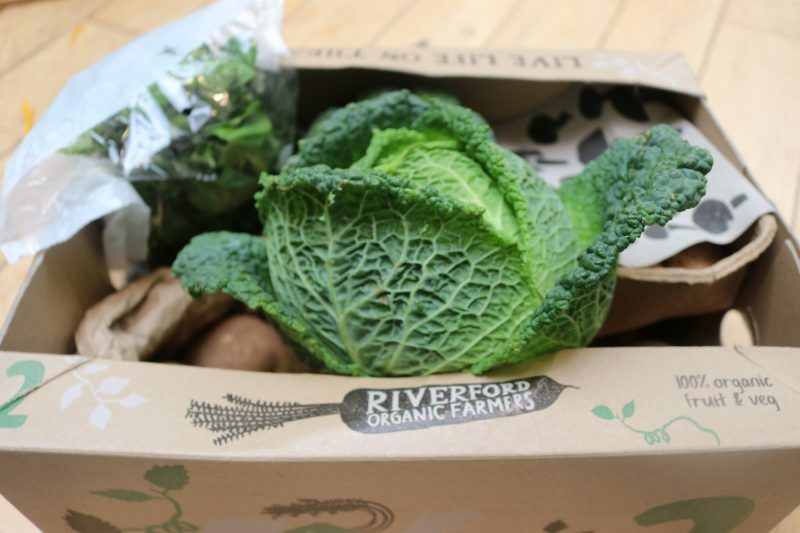 In fact, Riverford’s veg boxes contain 77% less plastic than equivalent packaged products from major UK supermarkets. Their dedication to use the minimum plastic possible is immediately clear as soon as I opened my veg box. 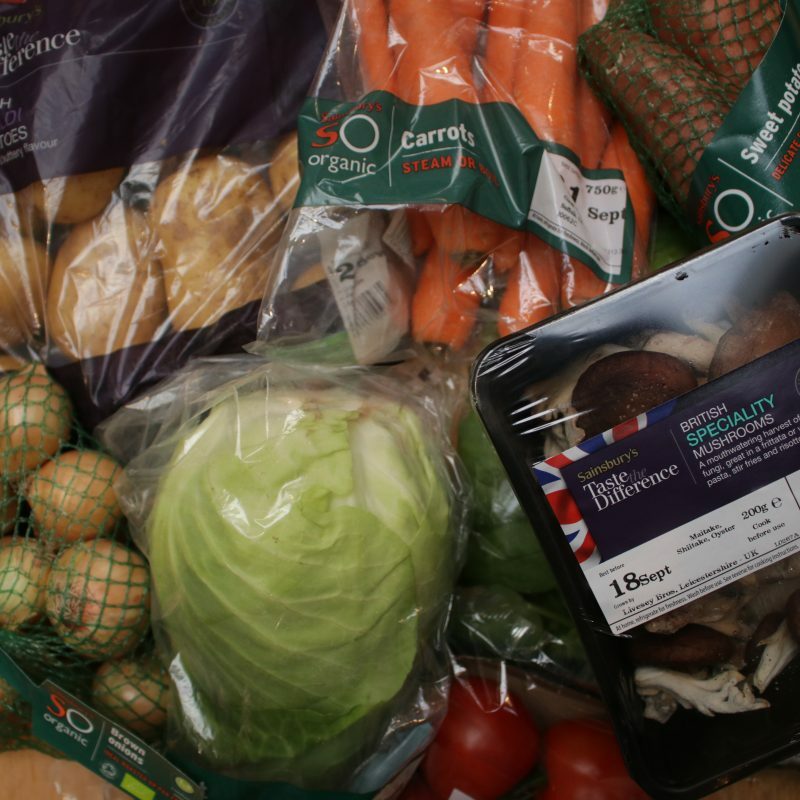 No sign of a single piece of plastic aside from one bag of salad leaves (without plastic, these leafy veg would dehydrate before reaching the front door, resulting in massive food waste – they’ve tested it.) and the rest? It lay there beautifully, with no need to rip it out of any plastic and fill up my bin. Riverford have done extensive research into this area, only using packaging when strictly necessary and certainly showing Sainsburys up in more ways than one (everything tasted amazing!). Important to note though, was that Riverford came in approximately £3 more expensive (approximately, because amounts differed slightly) than the supermarket shop. 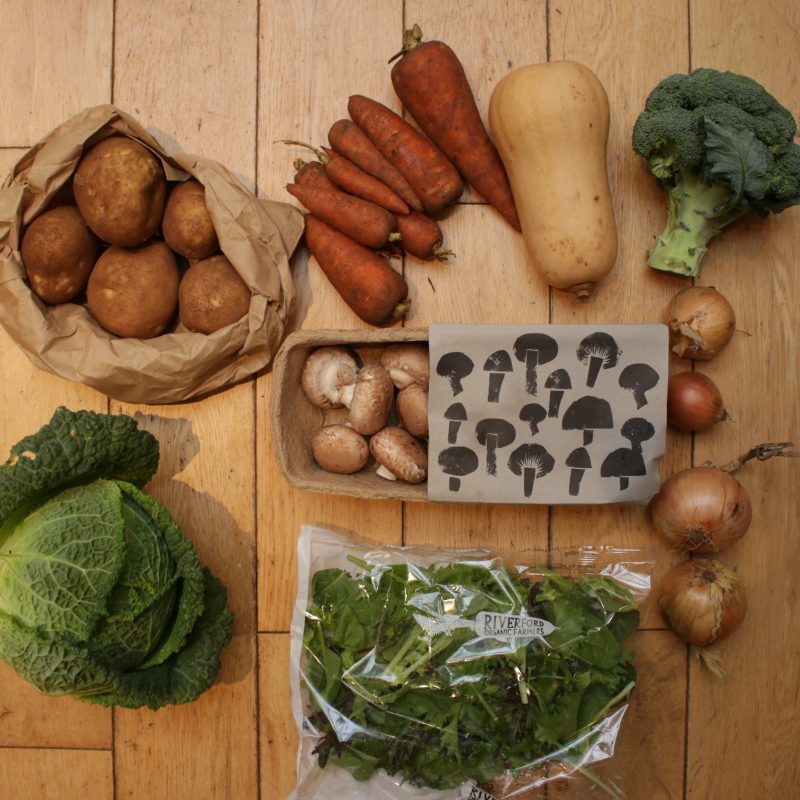 Check out in more detail what happened when I popped to my local supermarket, and how it compared to the Riverford veg box. What’s your experience of buying organic fruit and veg? Where do you source yours from? Pingback: Our Waste In A Week! I love Riverford and Abel & Cole, I swap between the two actually to change things up every now and then. The only thing I find is sometimes the fruit (never the beg for some reason) comes already a little mouldy or past its best which is a shame. But it’s still worth it as the majority is great, tastes better and greatly reduces our rubbish! Riverford veg may cost a bit more but I definitely tastes SO much better than even organic veg from a supermarket!